When news broke early this month that two Malay language experts in Singapore were donating their entire collection of 10,000 books to a Malaysian research institution, I was surprised. Not so much because Mr Yang Qwee Yee, 81, and his wife, Madam Chan Maw Woh, 74, found the Centre for Malaysian Chinese Studies in Kuala Lumpur a better home for their gift than any institution in Singapore. I was more struck by the cool reception here to the news carried on the front page of the Chinese language daily Lianhe Zaobao on July 2. It was neither widely reported nor discussed. But then again, perhaps I should not have been surprised. Few Singaporeans, especially the young, know of a time when younger Chinese in Singapore learnt and spoke Malay. Not many are aware that it was here that the Malay film industry began in the 1930s and thrived for decades after. Or that this was where the modern Malay literary movement Angkatan Sastrawan Lima Puluhan (Asas 50an) or Writers’ Movement of the 50s was launched in 1950. ‘Compared to Singapore, there are more people in Malaysia doing research in Malay. I’d like to see our collection put to good use rather than be locked away like some treasure. It should contribute to the understanding between the Malays and the Chinese, which is pressing in Malaysia,’ says Mr Yang. Mr Yang taught himself Malay in the early 1950s in his home town of Pontian, Johor. As a student at the former Nanyang University (Nantah) in Singapore between 1956 and 1959, he actively promoted Malay on campus. After he graduated, he went to Jakarta’s Universitas Indonesia to study Bahasa Indonesia for two years before returning to teach Malay at Nantah from 1962 to 1964. He has continued with his research work in the language since. He was conferred an honorary doctorate of letters by the National University of Malaysia in 2007 for his contribution to Malay language research. His wife learnt Malay on her own and has assisted him in all his projects. She worked first as a Malay language journal editor and later as a Chinese newspaper journalist. The couple has published dozens of books, particularly Malay dictionaries, some of which are widely used in universities in China where Mr Yang has been invited often to teach. Madam Chan has also translated Malay novels such as Cultural Medallion winner Isa Kamari’s Satu Bumi (One Earth) into Chinese. Both are from that generation of Chinese-educated who studied Malay diligently when Malaya became independent in 1957. They and several others actively promoted the learning of Malay in Malaya and Singapore, driven by strong anti-colonial and nationalistic sentiments. Their enthusiasm is seen in the numerous books and periodicals on Malay language and culture published during the 50s and 60s. Produced mainly by Chinese bookshops in Singapore, these books had a big following throughout Malaya, especially among those literate in Chinese. One senses the spirit of that time in Chua Mia Tee’s 1959 oil painting National Language Class, depicting a group of young men and women seated at a round table. It is evening, and they are having a Malay language lesson. Although the cosy room lit by a warm electric light seems a casual setting, the students look earnest and determined. The two short sentences on the blackboard - ‘Siapa nama kamu?’ (What is your name?) and ‘Di mana awak tinggal?’ (Where do you live?) - tell you that this is a beginners’ class, perhaps even the very first lesson. Artist Chua, now 81, was himself a student in the class. The work reflects how young Chinese Malayans were keen to learn the national language then. It reminds me of my own national language experience from the same period in a Malayan village. Besides regular lessons in school, my schoolmates and I joined working adults who organised evening classes and engaged Malay teachers to teach us in the classrooms of a village Malay school. As the school had no electricity, we used a kerosene pressure lantern for lighting. It attracted all sorts of insects from a nearby swamp, so we had to light mosquito coils to let us concentrate in class. Some of us became good enough in Malay to win debating and oratorical competitions against students from other villages. All these memories came back to me when I read someone lament in The Straits Times that most Singaporeans do not know Malay and cannot understand the words of Majulah Singapura, our National Anthem. It made me glad that I made a special effort all those years ago, and continued to study Malay while in university. Throughout my years working in Singapore I found my knowledge of Malay extremely useful. There have been occasions when I had to read reports in Malay and sometimes, translate them. At some social gatherings my Malay comes in handy when I meet Malaysians and Indonesians. The mood readily turns warmer when we start conversing in Malay instead of English. It remains useful even now, as I am following an online controversy in the Indonesian art scene and can discuss it with my Indonesian friends. Perhaps all is not lost for the younger generation in Singapore. My granddaughter who is in Primary 3 tells me proudly what she has learnt during her school’s conversational Malay programme. She can say what time she returned from school, and name the parts of her body in Malay. Conversational Malay was introduced at her school to strengthen bonds among pupils of different races and hopefully enable them to move about more comfortably in our region. Listening to her describe her Malay lessons so animatedly is immensely reassuring. The writer is the former executive director of Art Retreat incorporating the Wu Guanzhong Gallery, and a former journalist. Once a sleepy residential area, Tiong Bahru has roused from its slumber with at least one new shop opening in the neighbourhood every other month. Its reputation for being an upper-class estate where wealthy businessmen housed their mistresses in the 1930s and early 1940s gave way to a tight-knit middle-class estate with a kampung feel after World War II. And now, besides housing long-time residents and famed eateries that go back decades, the distinct 1930s Art Deco-style buildings of the neighbourhood are also home to quaint cafes, indie boutiques and hip working professionals. The estate's revival has drawn both locals and tourists, who on weekends, comb the main streets and back lanes of the sprawling residential area turned trendy destination. The neighbourhood's rejuvenation in the last decade has also made those abroad sit up and take notice. In the past five years, international publications such as American daily newspaper The New York Times and travel news website CNNGo have lauded the estate's beautiful architecture and unique mix of old- and new-world charms. 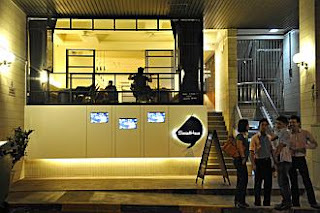 Premium coffee joint 40 Hands in Yong Siak Street is often attributed as the catalyst that drew all eyes to Tiong Bahru. It opened in 2010 and the owners helped persuade seven-year-old independent bookstore Books Actually to move from Ann Siang Hill to just across the road the following year. Within months, quirky boutique Strangelets, the bistro Open Door Policy and the restaurant SocialHaus opened alongside them. Yong Siak Street, which takes just two minutes to walk from one end to the other, has a total of five eateries and counting - Japanese restaurant Ikyu is expected to open there next month. Just this week, PS Cafe, which has four outlets here, started operating a 1,000-plus sq ft food and dessert test kitchen in Guan Chuan Street nearby. While the kitchen does not retail food yet, PS Cafe says that it is developing a retail element. There are currently 21 food and beverage outlets among the 64 HDB commercial properties in the Tiong Bahru estate. The Housing Board evaluates requests to convert a shop into an eating establishment based on criteria such as the layout and concept of the unit. Private buildings in the area fall under the purview of the Urban Redevelopment Authority, whose criteria for change-of-use applications are similar to HDB's. In spite of the F&B outlets that seem to have taken over the area, the enclave of conserved private pre-war homes, located just minutes away from the Central Business District, was popular as a residential area first. Ms Koh, who works at the Singapore Tourism Board and is also a co-founder of fashion boutique Nana & Bird in Yong Siak Street, paid around $200,000 for a 947 sq ft three-room post-war flat in 2006. These days, the same post-war flat would cost $600,000 to $680,000. And a 1,000 sq ft private pre-war flat with about 53 years left on a 99-year lease would set a buyer back by about $1 million now. Rental flats here are popular too, especially with expatriates. Property agent Alvin Yeo, 41, who deals primarily in Tiong Bahru homes, says rents for a typical 1,000 sq ft unit can hit $3,500 or $4,000 a month. Rising rents in the area have also hit businesses. Shop space rentals go for more than $7 psf a month, up from around $4 about two years ago. And the numbers are still climbing. The owner of Books Actually, Mr Kenny Leck, 34, expects his mid-four-figure-sum rent to double when the two-year lease on his 2,100 sq ft unit expires next year. Commercial space in the area is in such demand that mom-and-pop shops in Seng Poh Road, such as 74-year-old provision shop iEcon and 19-year-old hardware store Hock Eng Hin, receive offers from keen buyers every other week. Some eventually give in to these offers. One former owner is 60-year-old delivery man Wee Chye Guan. For more than a decade, he owned a provision shop in 78 Yong Siak Street, but sold the under 1,000 sq ft space earlier this year for what is said to be around $1.4 million. Mr Wee declined to confirm this. The new landlord has rented the space to a cafe called PoTeaTo. Some residents are apprehensive about the growing number of F&B outlets. Earlier this year, a resident called the police about it being too noisy at night, while others reportedly were unhappy about parking congestion on weekends. Businesses in the area have tried to be mindful of residents. For instance, SocialHaus added noise-absorbing velvet curtains to its windows to contain the music. One example of how the new co-exists with the old is 40-plus-years stall Ah Chiang's Porridge in Tiong Poh Road. Mr Cher Kee Chiang, 65, who has been selling porridge cooked over traditional charcoal stoves since the 1970s, sold his business for a five-figure sum to Mr Eddie Tan, 41, and his partners in 2005. In Mr Tan's hands, the small stall grew to occupy the entire coffee shop. Modern equipment, such as gas stoves, are now used in combination with charcoal ones to shorten customers' waiting time, but Mr Cher still works at the stall every day. 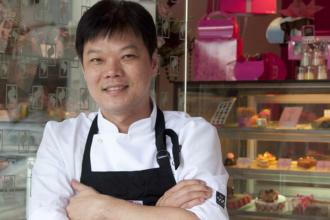 When pastry chef Steven Ong, 44, opened his high-end patisserie Centre Ps in Guan Chuan Street in 2007, old-timers warned him of his store's bad feng shui. Friends also advised against the location. Businesses in the area then consisted mainly of provision shops and coffee shops. His shop, selling luxe fare such as macarons ($2.50 each), pastries such as eclairs ($3.80 each) and custom-made cakes (1kg from $50+) seemed out of place. The former executive pastry chef at Conrad Centennial Singapore hotel, who noticed the space was for rent while in the area for its famed hawker fare, took the risk anyway. Five years later, Centre Ps is still there and thriving. Customers include expatriates, working professionals and grandparents who buy macarons and cakes as treats for their grandchildren. Mr Ong is now lauded for recognising the potential of the area. From being the only shop selling such pastries in the area, he now faces competition from other nearby cafes such as Drips Bakery Cafe in Tiong Poh Road and Tiong Bahru Bakery in Eng Hoon Street, which draws a good crowd throughout the day. But he is unfazed. Centre Ps does not have a seating area and relies on advance orders rather than over-the-counter sales. While the chef-owner declined to reveal sales figures, he says that business is better than it was five years ago, owing partly to the spillover from other eateries. And his macarons, which come in 20 flavours such as apple tea chocolate and black sesame, are a hit. Some customers place orders two days ahead to get the flavours they want. For decades, the ground-floor spot at 78 Yong Siak Street now occupied by newbie cafe PoTeaTo was a corner provision shop. PoTeaTo's owner, Ms Debra Chan, 32, says: 'The previous owners took a while to decide whether they wanted to sell because they wanted to seek the blessing of the former owners first.' This was made difficult by the fact that the former owners had died. They must have given their approval somehow, as it did get sold. Ms Chan, who rents the shop of just under 1,000 sq ft from the new landlord, decided to keep the provision shop's wooden green backdoor, which adds to the raw feel of the cafe's brick- and-cement walls. She opened PoTeaTo just over a month ago. The casual tea joint is one of the newest arrivals in a street already popularised by the likes of coffee joint 40 Hands and independent bookstore Books Actually. 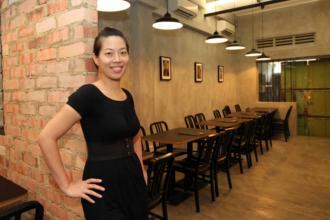 Ms Chan had always wanted to open a cafe and left a marketing job to do so earlier this year. PoTeaTo, located just a few doors down from 40 Hands, serves potato dishes and other bistro fare such as soup and pasta. The first-time cafe owner took notice of the area when some friends moved into the estate about two years ago. It gave her an excuse to visit the neighbourhood. Charmed by its homely vibe, she decided that the place would be suitable for her hole-in-the-wall cafe. HE MAY not be a resident of Tiong Bahru, but 64-year-old Mr Tan Han has been involved in grassroots activities in the area for more than 20 years. Last Saturday, he and two other guides led a group on a heritage trail around the Tiong Bahru neighbourhood for the Singapore HeritageFest. He is one of 250 volunteers for this year's festival. When asked about his connections with Tiong Bahru, Mr Tan said they started in the 1980s. He was working at the Singapore Broadcasting Corporation (now MediaCorp), and was involved in promoting the Channel 8 serial Five Foot Way. He got to know the management committee at Tiong Bahru Community Centre when the Chinese drama serial held promotional activities there. 'My wife also lived here before we got married, and I used to come here for dinner a lot,' said Mr Tan, who is now part of the management committee at the community centre. This year, Tiong Bahru Community Centre partnered with National Heritage Board to conduct a heritage trail around the estate for the Singapore HeritageFest. 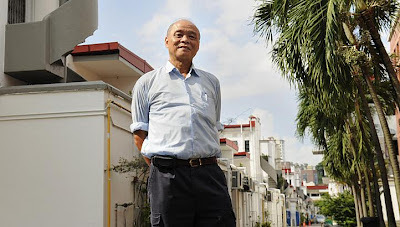 For Mr Tan, a retired tour guide, leading a group around Tiong Bahru was 'a natural thing to do'. 'I like to interact with people and tell them about Singapore's history,' he said. post-war flats and, more recently, eateries and stores favoured by youngsters. When asked if he liked the new crop of shops, Mr Tan said they make Tiong Bahru more colourful and interesting. 'But I have not been to any of these new shops. It is a bit awkward for someone my age to go to such places,' he said. DELIVERYMAN Wee Chye Guan was happy living in Tiong Bahru until a new crop of hip eateries popped up in his estate. Along Yong Siak Street, where he lives on the ground floor of a four-storey block, three establishments - 40 Hands, Open Door Policy and SocialHaus - have opened in the last two years. They occupy the ground floor of the area's famed walk-up apartments. 'The diners talk and laugh very loudly at night, and it gets worse when they are drunk,' said Mr Wee, 60, adding that he has called the police several times. 'It used to be quiet on this street,' added the resident of more than 20 years. Other residents said the new arrivals have brought parking woes, especially on Friday and Saturday nights and eve of public holidays. The new kids on the block are cafes 40Hands, which opened in 2010, and The Orange Thimble and Drips Bakery Cafe, which did so last year. Open Door Policy, a restaurant, and SocialHaus, a restaurant and bar, also opened last year. They add to the 18 food joints already in the area, such as the well-known Por Kee Eating House and Ah Chiang's Porridge. The Straits Times understands that at least two more food and beverage outlets will be opening in the estate this year. It is not a prospect that Yong Siak Street resident Regina Tay, 37, welcomes, as she already finds the street congested. 'Diners park on both sides of the road, despite double-yellow lines on one side and season-parking spaces on the other,' said the lawyer and resident of five years. She has called the Land Transport Authority (LTA) several times to complain. 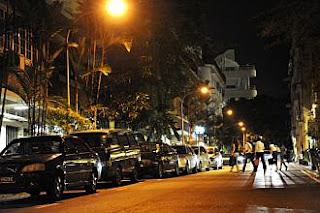 Ms Eleanor Chong, 34, a senior manager who lives in Seng Poh Road, said there are nights when she has to park farther away because diners have taken up the season-parking spaces. Residents are hoping that a limit can be set on the number of food and beverage outlets opening in the area, taking a cue from what has happened in Serangoon Gardens. Acting on residents' complaints over parking, the Urban Redevelopment Authority (URA) imposed a ban in February on converting more Serangoon Gardens shophouses into eateries. In Yio Chu Kang, the URA did not allow three eateries to renew their licences because of traffic problems. 'There should be control now, why wait till that stage to try to resolve a big problem?' asked civil servant Deanne Tan, 34, who has lived in Yong Siak Street for two years. A spokesman for the Housing Board, which manages the shop spaces on the ground floor of the walk-up apartments, said it evaluates requests to convert HDB shops into family restaurants based on factors such as the layout, concept and location of the unit, and whether the proposal will inconvenience residents. Private buildings in the area fall under the purview of the URA, whose criteria for vetting change-of-use applications are largely similar to HDB's. Meanwhile, residents have made their grievances known to the new eateries. Mr Mark Teow, owner of SocialHaus, said he will close the front windows at 10.30pm to contain the noise, and has installed noise-absorbing velvet curtains at the front and back. Spa Esprit, which owns 40 Hands and Open Door Policy, advises diners not to park in Yong Siak Street. 'We direct them to the large parking space at the back of 40 Hands,' said Ms Janet Lim, public relations manager of Spa Esprit. Tanjong Pagar GRC MP Indranee Rajah, who has received complaints about parking, said there is no space to build a multi-storey carpark in the estate. She has asked the HDB to consider installing electronic signboards to indicate parking options in the area, such as the multi-storey carpark in Kim Tian Road. But while some residents said they plan to come together soon as a group to meet their MP, others said there are benefits to having more eating places too. 'I don't think there are too many outlets, as they offer different foods,' said public relations director Jansen Siak, 39, who has lived in Tiong Bahru for almost three years. Retiree Mok Hin Wing, 79, a resident of 46 years, feels that the new facilities have given a fresh feel to the neighbourhood. 'Tiong Bahru is livelier now, and I like the buzz,' he said. For a historic look at spending in America, see our post What America Buys. For more, see our Graphing America series. How do Americans spend their money? And how do budgets change across the income spectrum? The graph below answers these questions. It shows average household spending patterns for U.S. households in three income categories — one just below the poverty line, one at the middle of the income distribution and one at the top of the distribution. Both the similarities and the differences are striking. Everyone devotes a huge chunk of their budget to housing, for example. Poor, middle class and rich families spend similar shares of their budgets on clothing and shoes, and on food outside the home. The figures in the graph come from the Consumer Expenditure Survey, which has tons of data on spending patterns in the U.S. Correction: A previous version of this post incorrect numbers for spending on housing. SINGAPORE, it seems, is getting angrier and angrier. Take a look at the exchanges online, or recall the recent clashes between commuters on buses and trains, and you'll notice what appears to be a trend of volatile tempers and deepening rage, whether it's directed at the Government, foreigners or a fellow passenger. Singaporeans are angry with the Government for - quote, unquote - messing up public transport, allowing too many foreigners to come in, and making homes so expensive. They're also increasingly resentful of foreigners for coming in and stealing their jobs, their university places and their scholarships. And they're increasingly frustrated with one another for taking their precious seats on the MRT, and for deigning to set up elderly facilities in their void decks. And they're angry because the authorities don't seem to take their complaints about these seriously enough - or because they answer their questions with a question. As more than one observer has commented, 'we are an angry society'. What is happening? Why is a society that prides itself on tolerance and courtesy getting more easily worked up these days? Why does the little red dot seem to be getting redder? Many lay the blame at the Government's door. After all, the influx of foreign workers and overcrowding on trains and buses can be linked to government policy. You could also attribute the strong sentiments to a boiling over of accumulated frustration, or a change in the relations between the Government and the governed. Singapore isn't unique in that sense. A deepening frustration with rulers has prompted protests around the world, from Occupy Wall Street in America to the Arab Spring in the Middle East, and Bersih across the Causeway. But that would not fully explain the intensity of the rage that seems to emerge when something goes wrong in Singapore, or when an incident arises reminding the populace of a sensitive subject, whether it's a lax immigration policy, wage gap or social injustice. Neither would it account for the bitterness of the vitriol sometimes seen in online as well as verbal exchanges. Is there something else that is driving the anger? A look at the touchy topics seems to suggest a common thread running through them. The resentment against foreigners essentially boils down to a competition for jobs. The frustration over the location of facilities in backyards could be simplified as competition for land and personal space. The indignation of not having one's voice and opinion heard, or being 'engaged' enough, could be likened to a competition for attention. And the anger against fellow citizens sometimes comes down to competition for, well, a seat on the train. Or a place in the queue. Of course, competition isn't a new thing to Singaporeans. But it had not been so intense before. Singaporeans have always had to compete for jobs, but they've never had so hard a time. Not only do they now have to compete with one another for the best positions, but they also have to fend off competition from abroad. They've never had to compete so much for space, whether it's in their shrinking backyards, on the bus, or in school or university. You could blame some of it on government policy, but a large part of it is undeniably a natural result of living in a city-state. With the pace of life accelerating, the competition for jobs, land, space and time is taking a greater toll than before. In other words, the rat race is getting a lot harder. Singaporeans are finding they have to run faster on the treadmill just to stay in place. The intensifying competition could be one of the sources of the me-first attitude and the rising anger, much of which ends up directed against the marshals organising the race, the new contestants hoping to join in, and even fellow competitors. Is this modern-day race inevitable? Or is there another way? Some would argue that the nation - here they really mean the Government - has a choice. It could relax in its pursuit of economic goals, rein in population growth and immigration, improve public transport and ensure that land development leaves enough green spaces. Certainly, this is something worth thinking about in policymaking - how to make the little red dot grow bigger, not redder. But with just 700 or so sq km and the ever-growing external pressure from globalisation, there is surely a limit to what the authorities can do. Some have argued that individuals can choose to drop out of the rat race. Parents can opt not to push their children to qualify for an elite school. Homebuyers can pick a smaller flat. People can consider a simpler lifestyle. All these would translate into less worry about getting the best tuition, or striving for more pay and promotions. But these options come at a price. Opting out of a good school could risk a child's future. Taking it easier in a job could mean losing it altogether. Buying a small home would mean a smaller asset to cash in for retirement later. Some would surely find the costs too high. With everyone running ahead, getting left behind would mean compromising on the quality of life or giving up hopes for a better one. Less pay, less luxuries, less achievements. Others may deem the choices simply irresponsible. Parents, for example, would not want to risk their children's future. There is, after all, a difference between kiasu (scared to lose) and kiasi (scared to die). Some will argue that there are also instances in which choices aren't available, at least not in a city-state. You can't choose which bus or train to take to avoid the crowds, or which park to take refuge in for a spot of solitude. There are some, however, who have taken the plunge, quitting high-paying jobs for a simpler lifestyle or more time with the family. Ultimately, it is probably inevitable that Singaporeans will have to stay in the rat race. But maybe - just maybe - it is possible to run at your own pace.